Platdun Returns: You Did It! 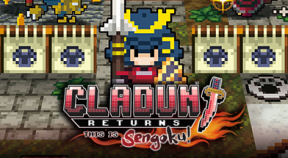 Obtain all trophies for Cladun Returns: This is Sengoku! Complete the Magic Circle tutorial. Play a Neo-geon or Tri-geon for the first time. Update Clear Time for the first time. Register in Rankings for the first time. Release and recruit a soul for the first time. Clear all stages in the story. Level a character from 1 to 99. Obtain equipment in a dungeon that has 4 titles. Obtain a rare artifact in a dungeon. Expand a fort to its maximum. Complete every entry in the Bestiary. Complete all quests in the suggestion box. Clear the 99th floor of a Neo-geon. Clear the 99th floor of a Tri-geon. Have a character learn every Magic Circle. Have a character reach LV 99 in every job. Increase your Fame to 999.